Ignore Melissa and Doug box- it's just a photo prop. The kids have been watching The Great British Bakeoff recently. My lovely friend sent me recordings of the first season and we have become instant fans, albeit several years late. Particularly Jenna, who loves all things baking, and watches the episodes over and over again and, before she watched the finale, took polls among family members on whether Ed, Miranda or Ruth should win. 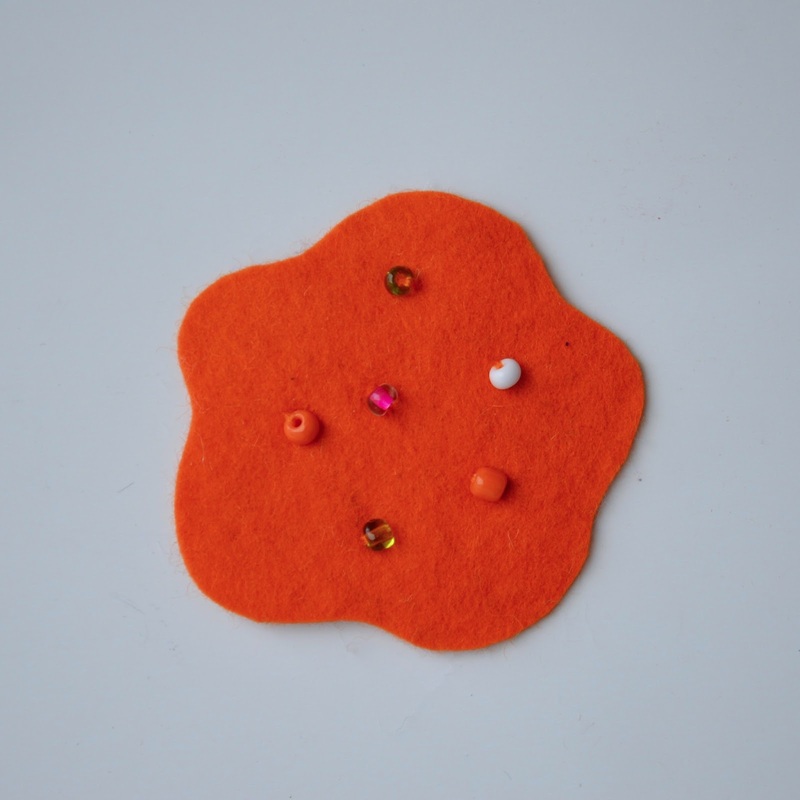 Then all three girls held their own bakeoffs at home with all our felt food. I got to be the judge and walk around their tables, looking imperious and commenting on their novel flavor combinations (green beans and strawberries, anyone?) and congratulating them on avoiding the fatal "soggy bottoms" in their pastries and cakes. 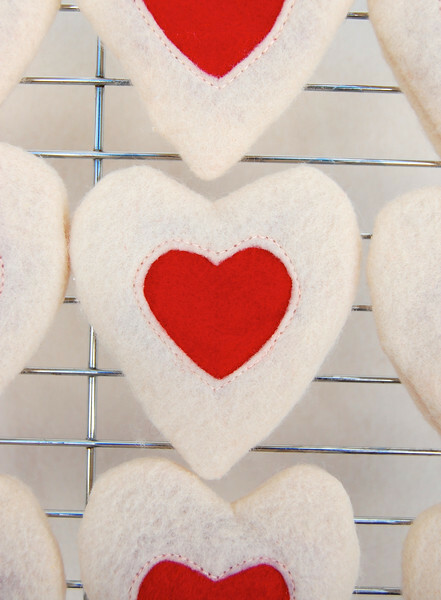 Our felt food is so loved that it has been played with to death in our home. All kids should have felt food, I think. And wooden food, too. Unfortunately, wooden food takes skill to assemble and paint. 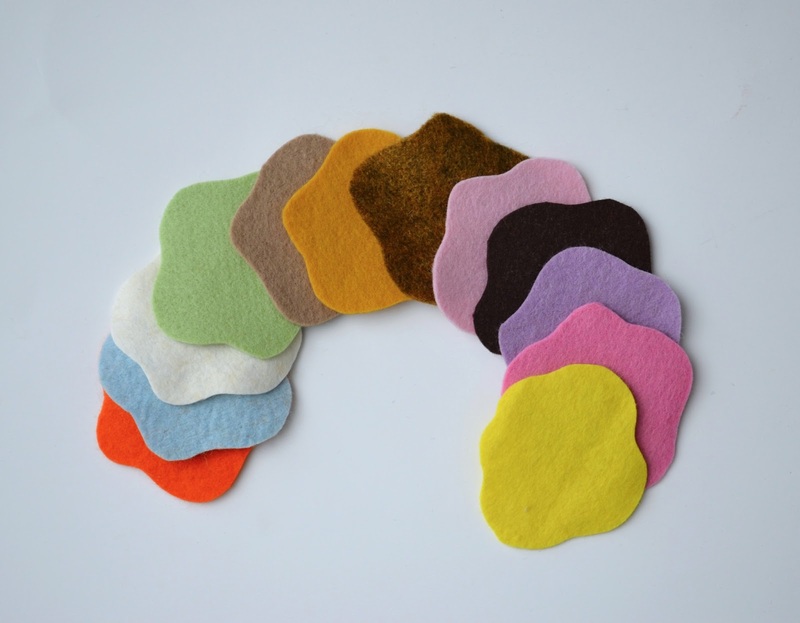 Felt food, on the other hand, can be made by anyone who can cut circles out of fabric. Including exhausted and jetlagged anyones. 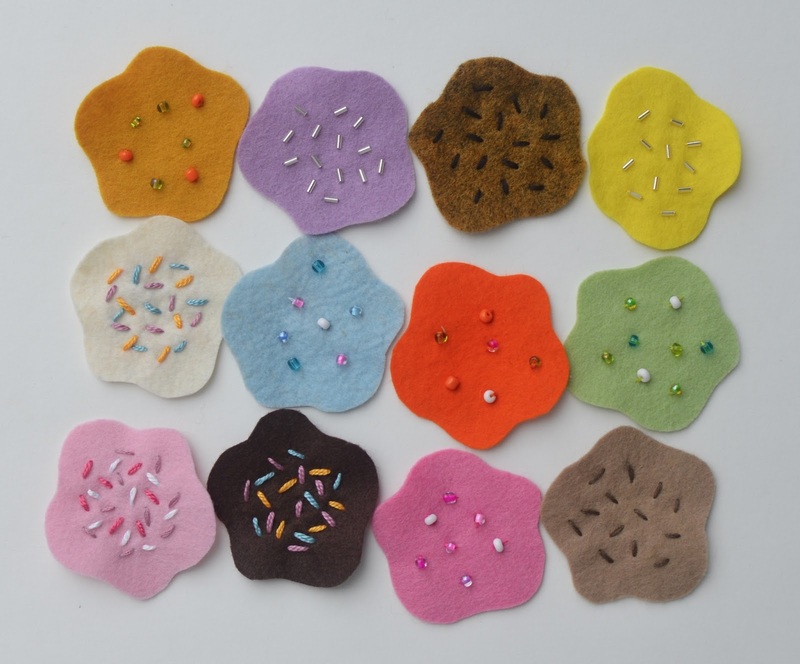 And so, now that I'm back home and needing a low-intensity sewing project to ease myself back under the presser foot, I made some felt confections for Kate's upcoming school fundraiser. With frosting removable or permanent. 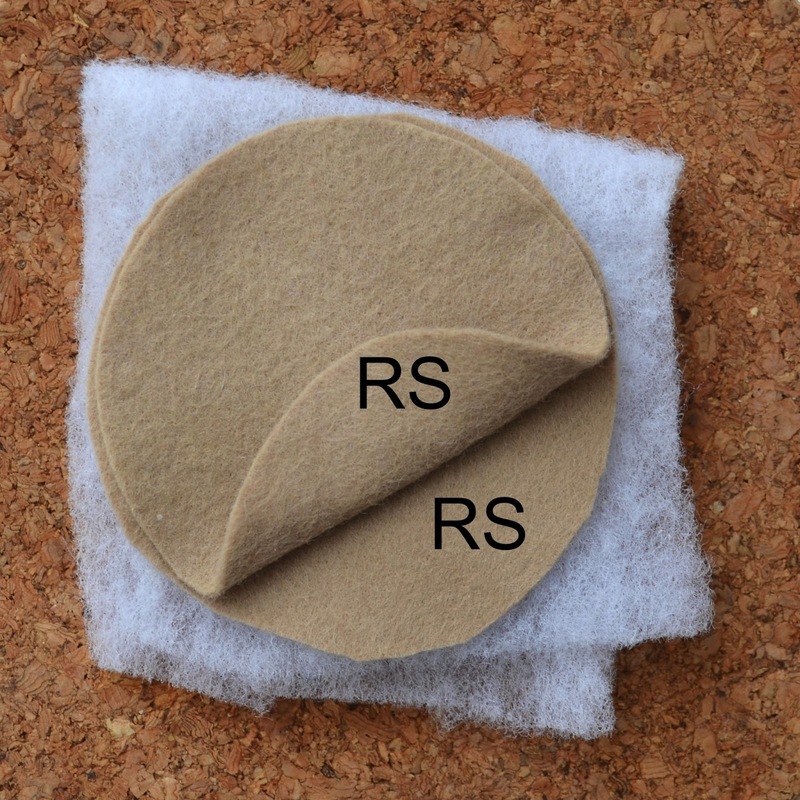 Two felt circles, RS together, layered on batting. I used two layers of low-loft. 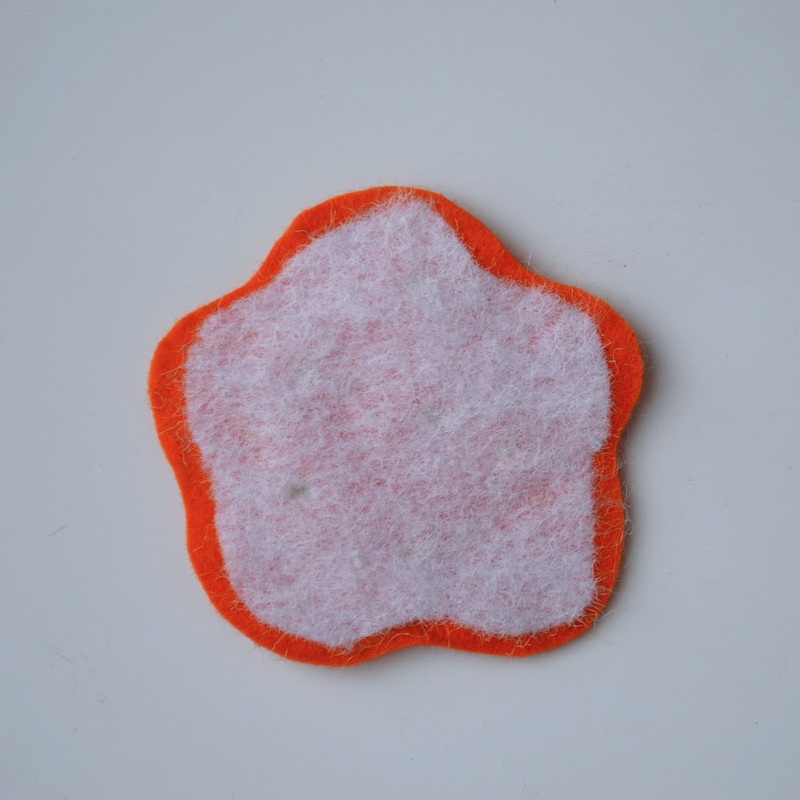 you'll want to applique the frosting on the RS of one of those felt circles BEFORE sewing both felt circles together. Sew all around through all the layers, leaving an opening. Peel back the top layer and baste the bottom layer onto the batting, within its SA. 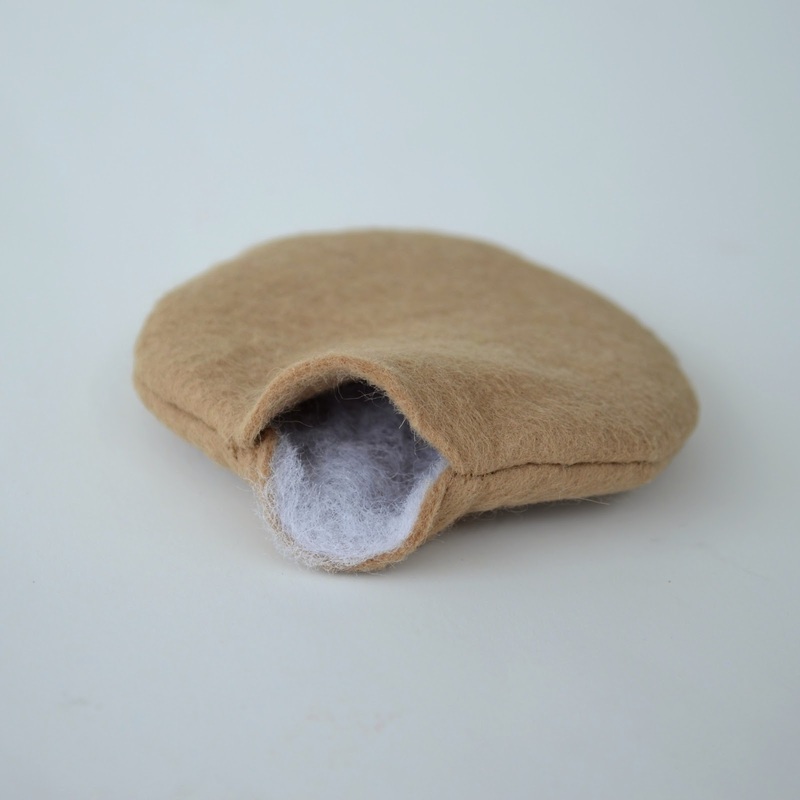 This is just to hold the batting to the felt when hand-stitching the opening closed later. 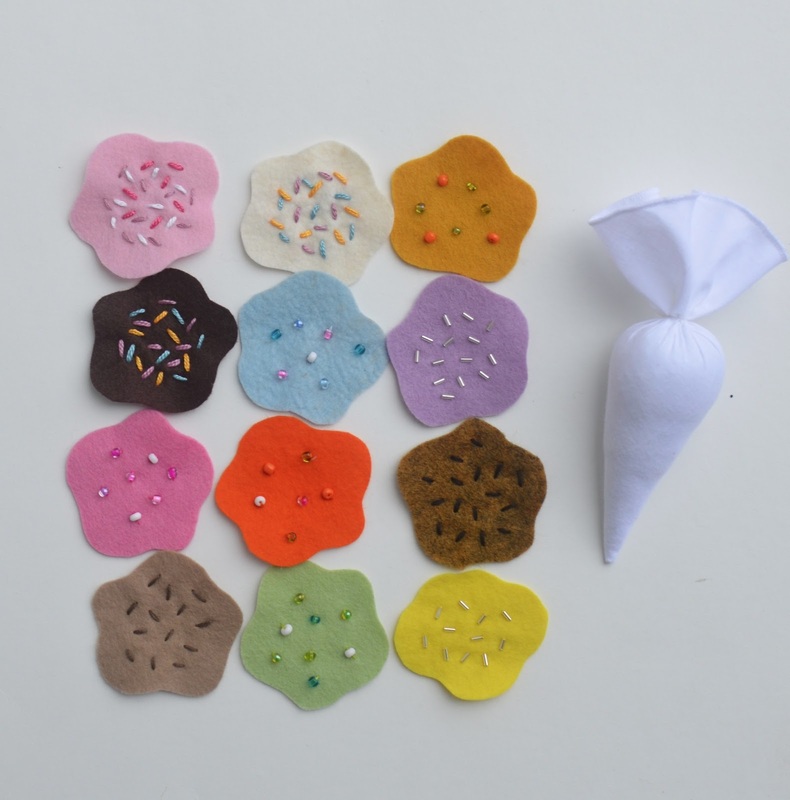 Cut out frosting shapes from felt. Iron fusible fleece on the underside to cover up all the knots and thread. 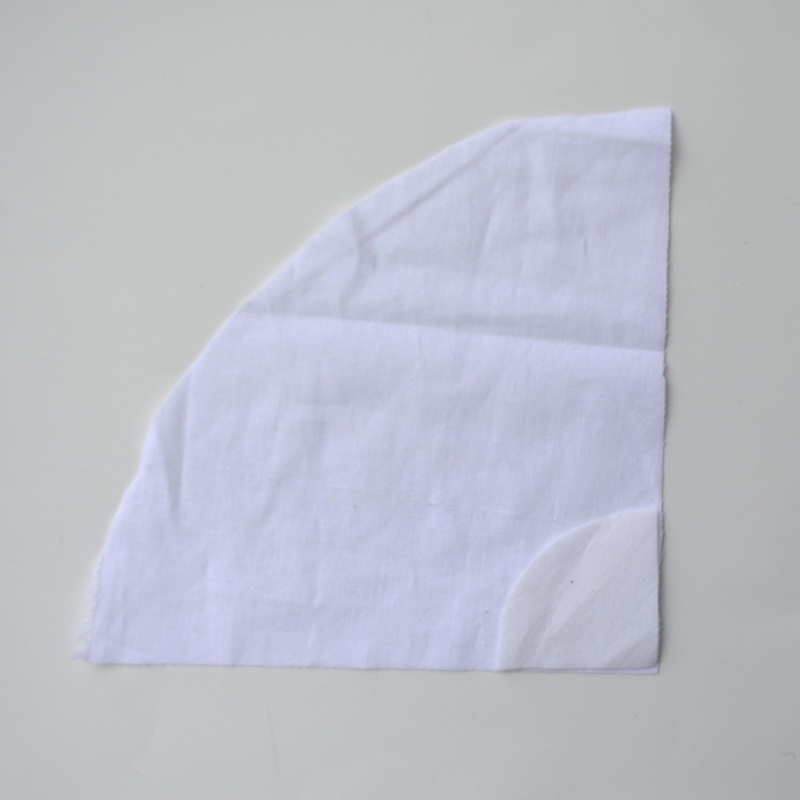 Cut a quadrant of a circle from white fabric. 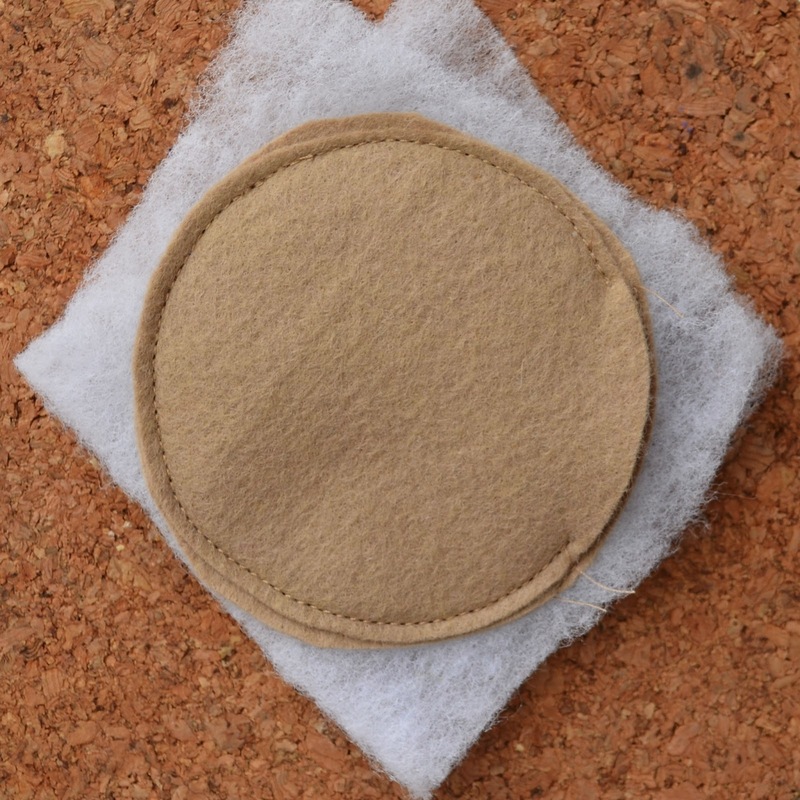 And a small quadrant of a circle from fusible interfacing. 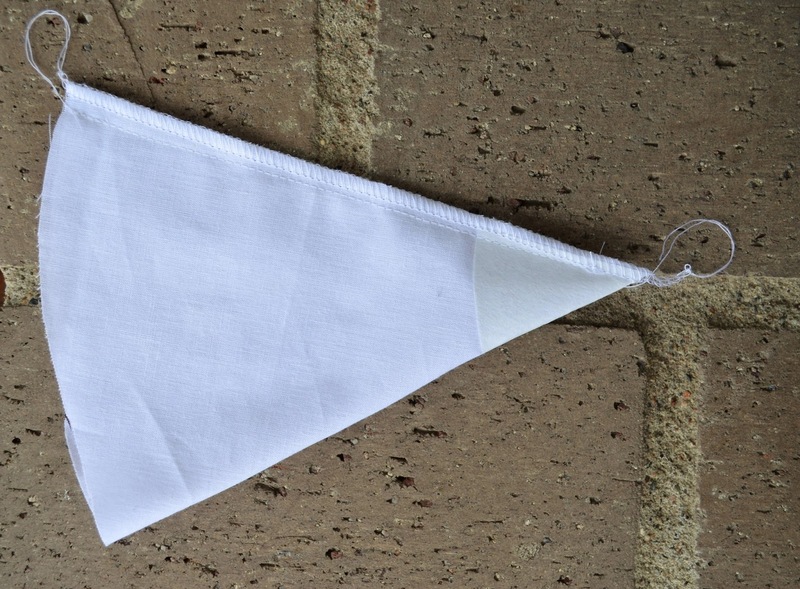 Iron interfacing to the corner of the WS of the fabric. 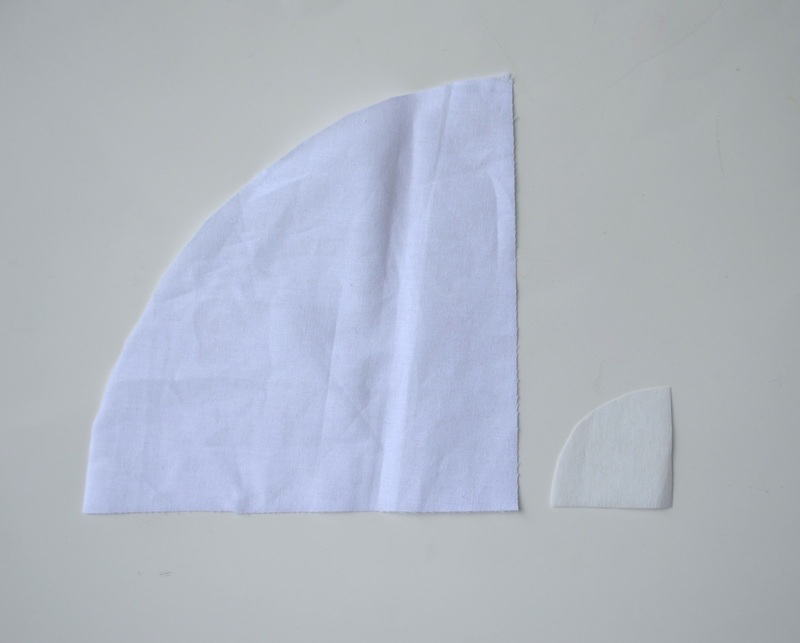 Fold fabric in half, WS out, so the straight edges line up and the shape is an eighth of a circle. Sew the long edges together and serge/zigzag. 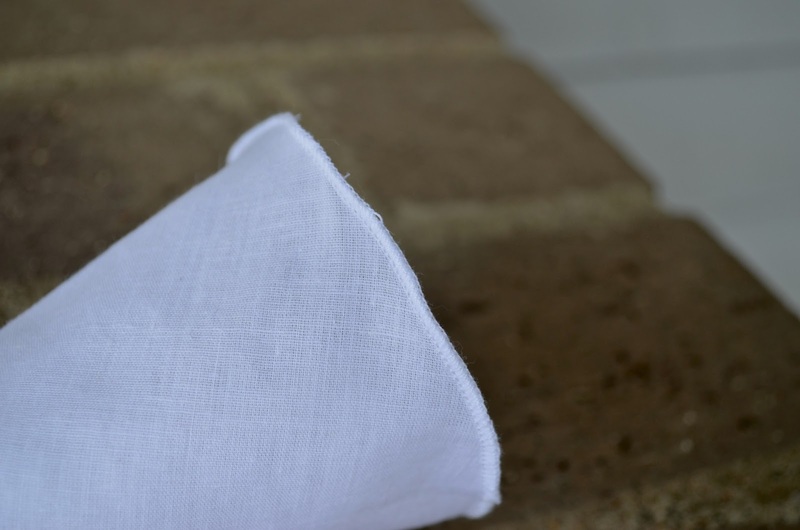 Finish the curved edge of the resulting cone - I made a rolled hem. 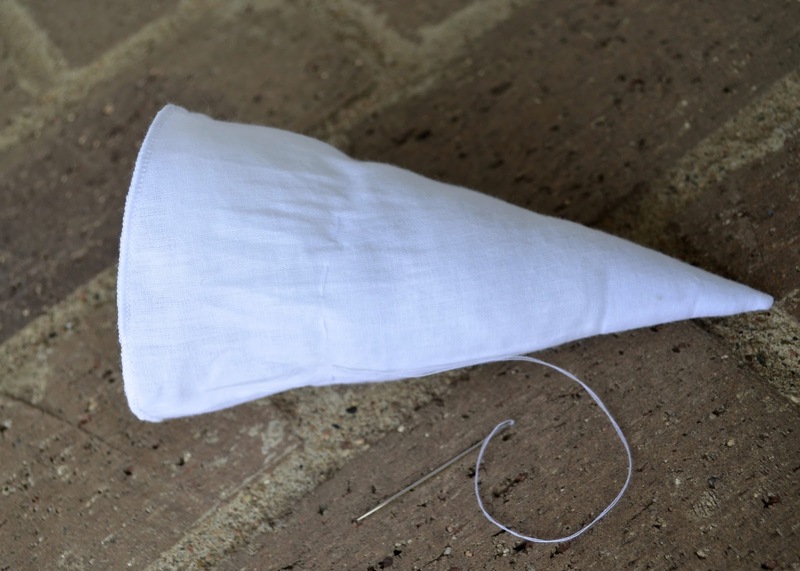 Knot a double-length of thread and sew basting stitches partway down from the opening, all around the cone. and pull thread to gather the basting stitches into a tight neck. Wrap thread around neck a couple of times, poke your needle through the neck and then secure with a knot. 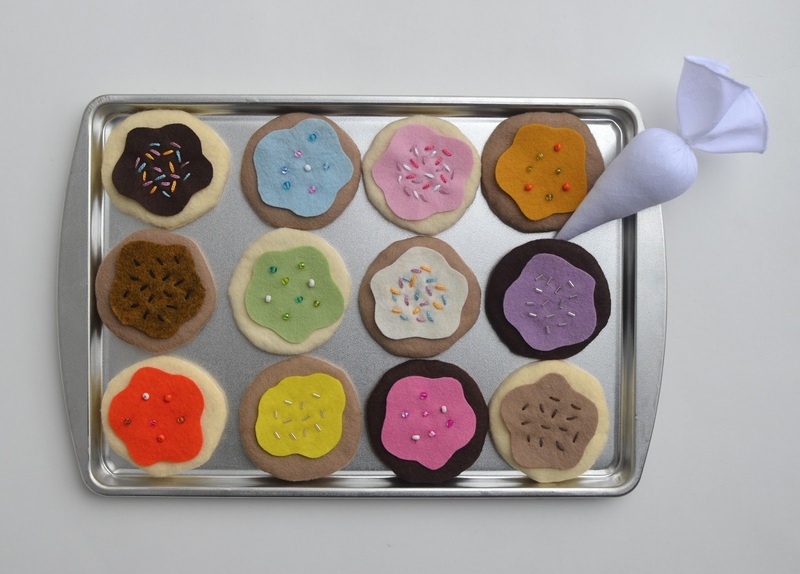 Combine cookies, frosting and piping bag. Invite children to give comments. Panic when children run off with cookies, deaf to mother's feeble cries of, "But they're not for you. They're for the fundraiser! Please don't get chocolate all over them. Did you wash your hands? Go wash your hands! Please wash your hands!" 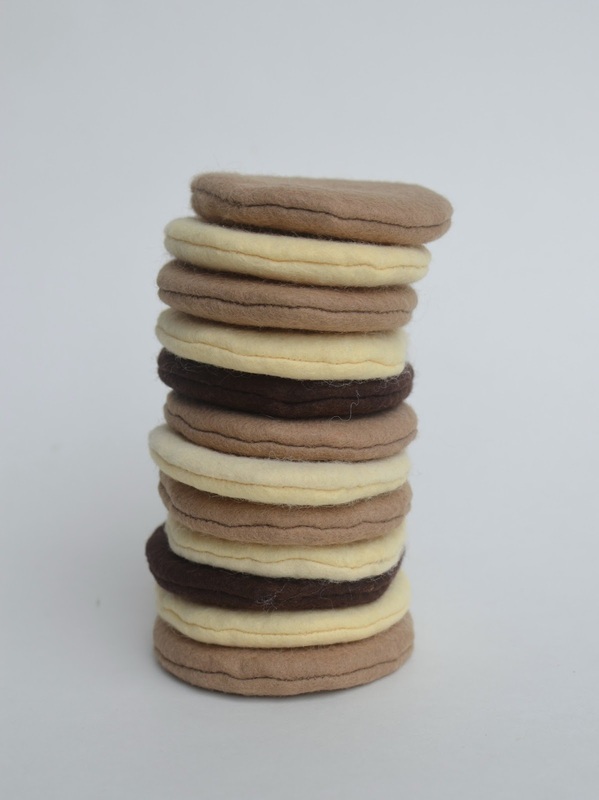 If you want a short cut, you can buy printed cookies and layer them on felt and batting to get the same puffy effect. See - so cute, right? And totally should've been done for Valentine's Day except when am I ever in time to observe any holiday? Throw in another piping bag. 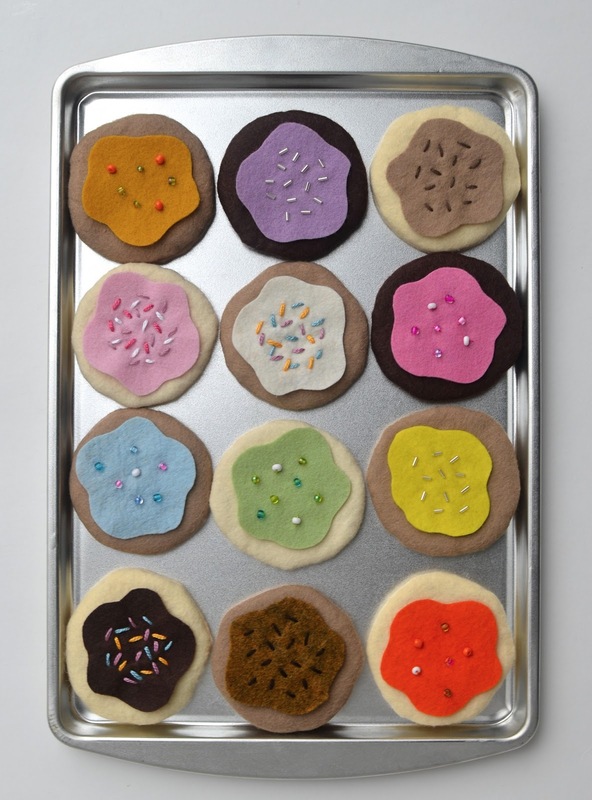 In fact, make multiple piping bags and let your kids hold their own cookie-decorating version of the Great British Bakeoff. They're going to run off with the rest of your felt food anyway. 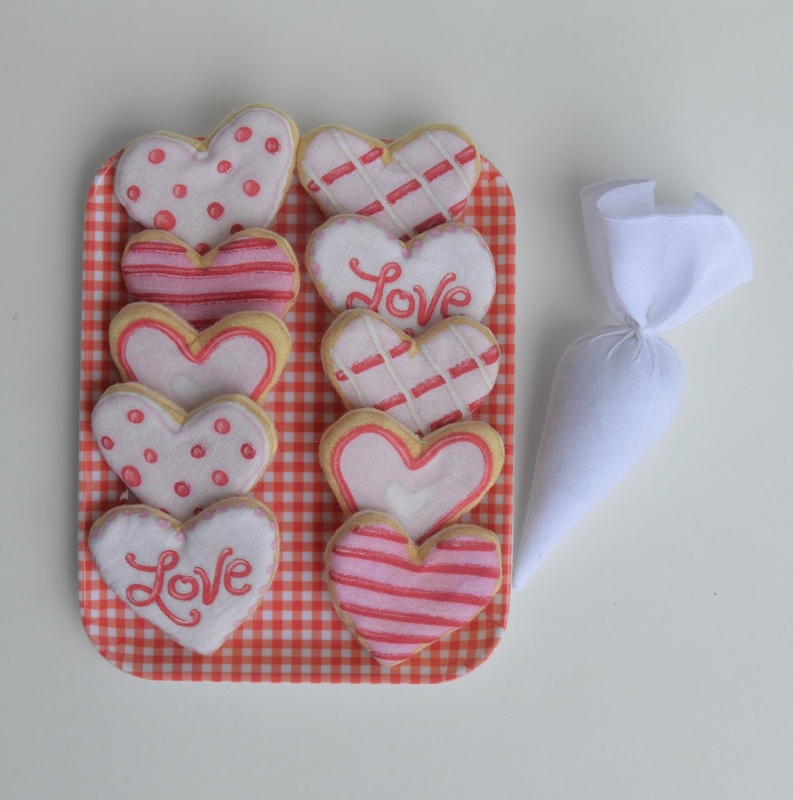 Q Where did you get that heart cookie fabric? A Random fabric store. I think it was Mill End Textiles. Saw while looking for lycra for Emily's swimsuit, thought of Jenna, and bought. 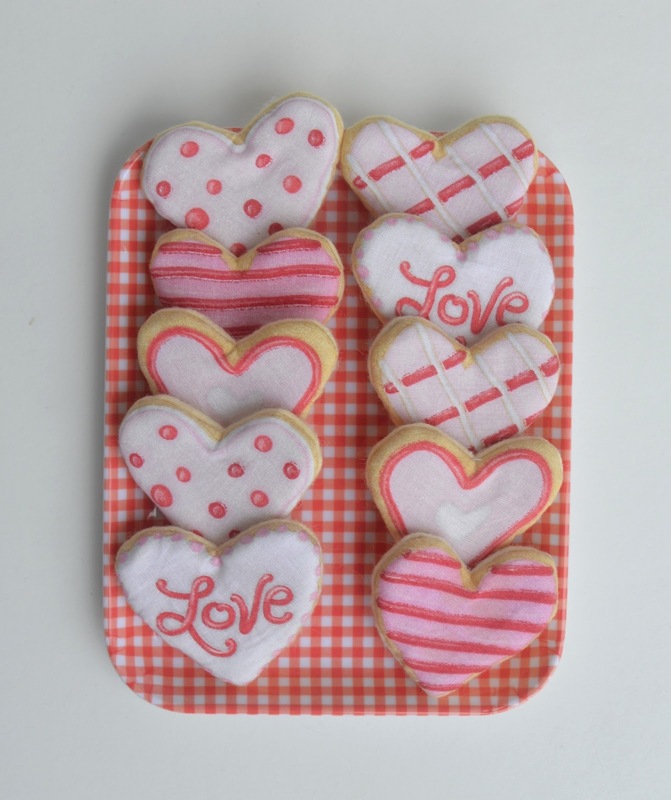 Q Where did you get that checkered tray that's holding the heart cookies? A In Singapore. I think Daiso, but it was about 6 years ago. 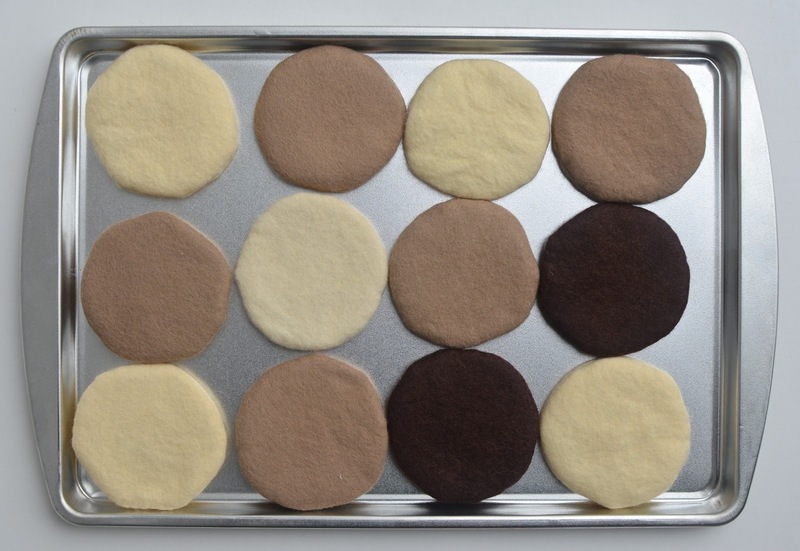 Q Do you have a pattern for the round cookies? A Barf. They're circles. Make your own pattern. 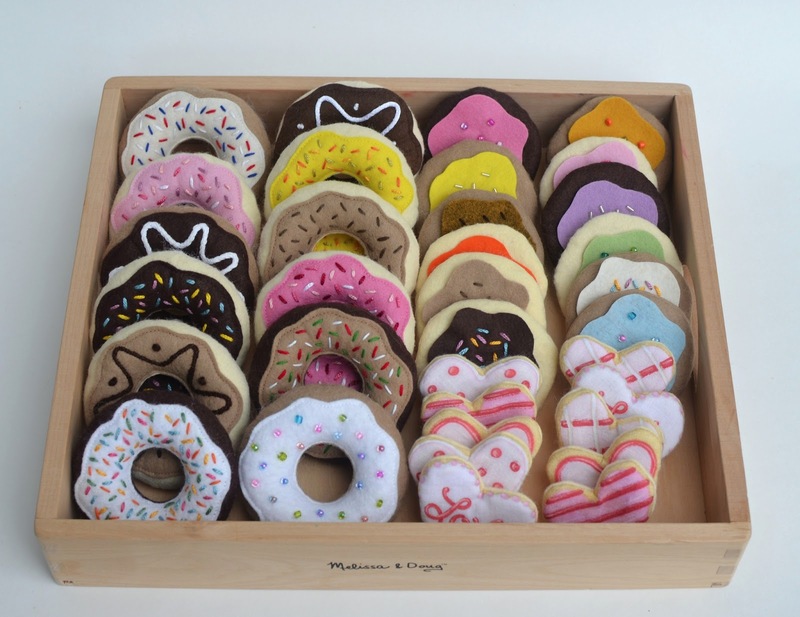 Q Do you have a pattern for the donuts? A Barf again. They're circles (again). Concentric circles, to be precise. Make your own pattern. Alternatively, you can go to the donut-shop-on-the-go post that I linked to, and find the link to the tutorial I used. 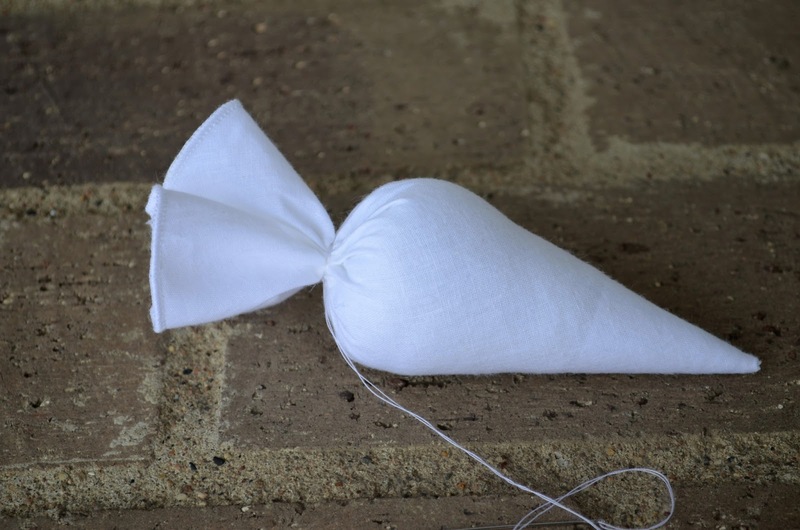 Q Do you have a pattern for the piping bag? A BARF! It's a quarter of a (again) circle! Q Yes, but how big was the circle? 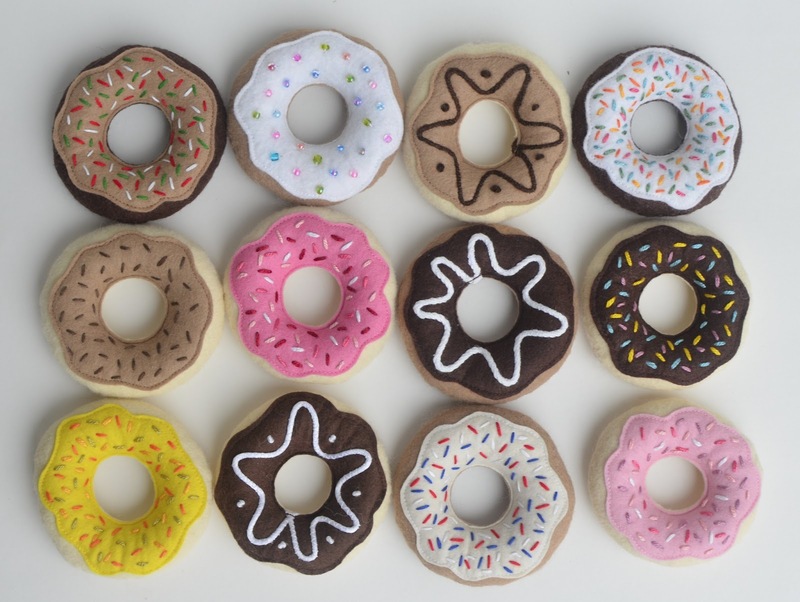 And the cookie circles? Can you tell me to the nearest eighth of an inch? A I'm logging off now. All three confection sets are going to Kate's fundraiser tomorrow, not my shop. 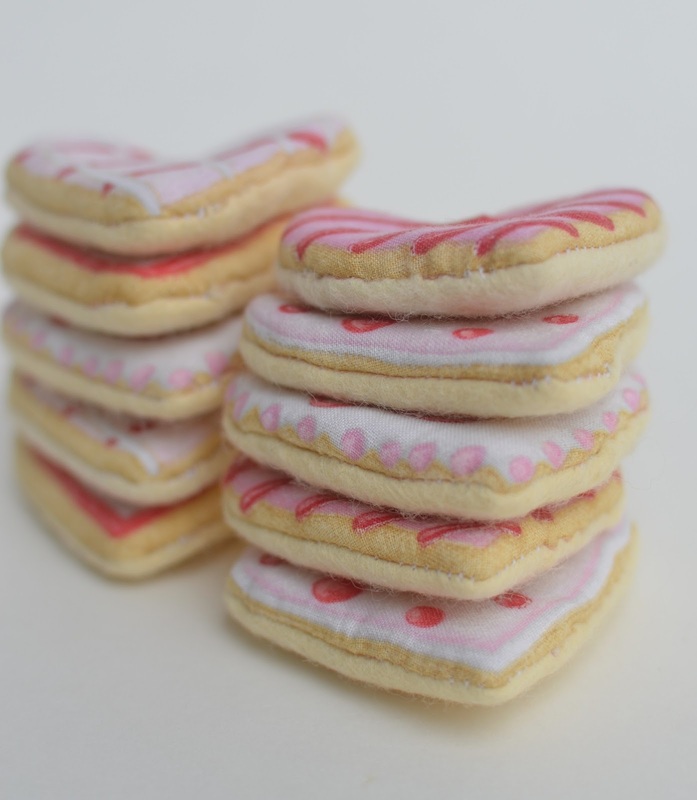 However, if anyone is interested in the heart cookies, let me know and I may make some sets for the shop at some point in the future. But not the doughnuts or frosting cookies - too much hand-stitching to be a viable project at the moment. I think, is it real? 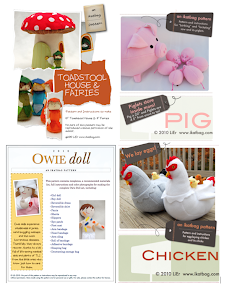 I love the idea of a felt bake off. My girls are obsessed with cupcake wars and have already held 2 real bake-offs. This would sake so much on cleanup. this is so cute - my daughter isn't quite old enough for this yet but I'm definitely pinning it until she is! 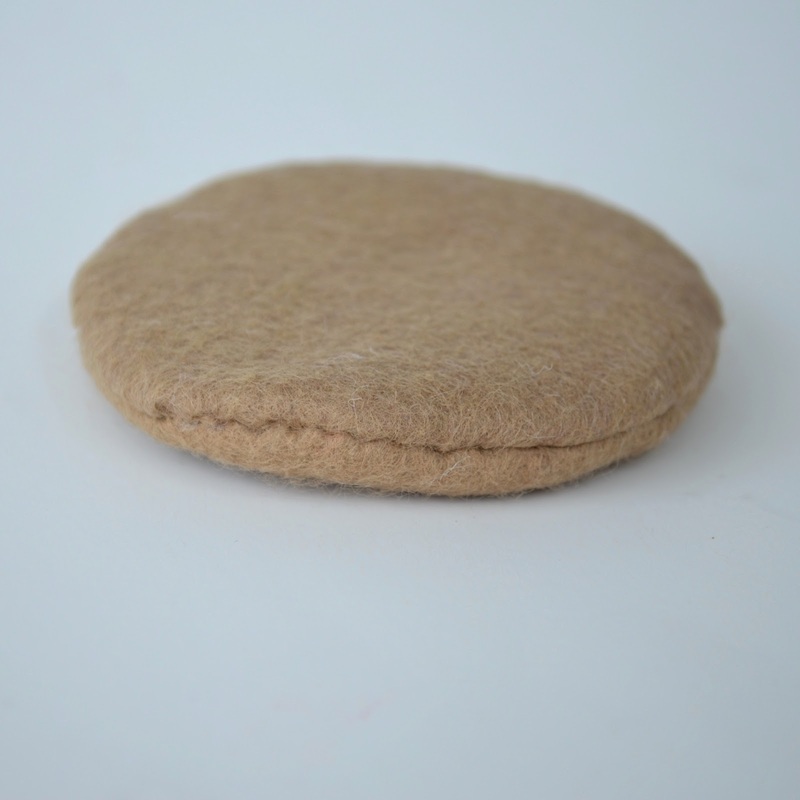 Felt food is great as children's toys and yours are so beautiful. What lucky girls (and classmates) you have! I bet my Emma would adore that show! I'm completely in LOVE with this tasty treats! You did such a great job with them and I am definitely saving this for when I make my daughter a play kitchen for her birthday. I shared your treats on my blog today as part of what I'm loving this week. I would love for you to come by and check it out sometime. Thanks for always being such an amazing inspiration! Wow, when I opened my email I thought at first it was recipes for donuts. Good Job. You fooled me! These are wonderful, but as I former pastry cook I especially love the addition of the piping bag! Lier, I love your designs but the anticipated questions are just so brilliant. Thanks so much for the laugh they gave me. lol, love the Q&A section! 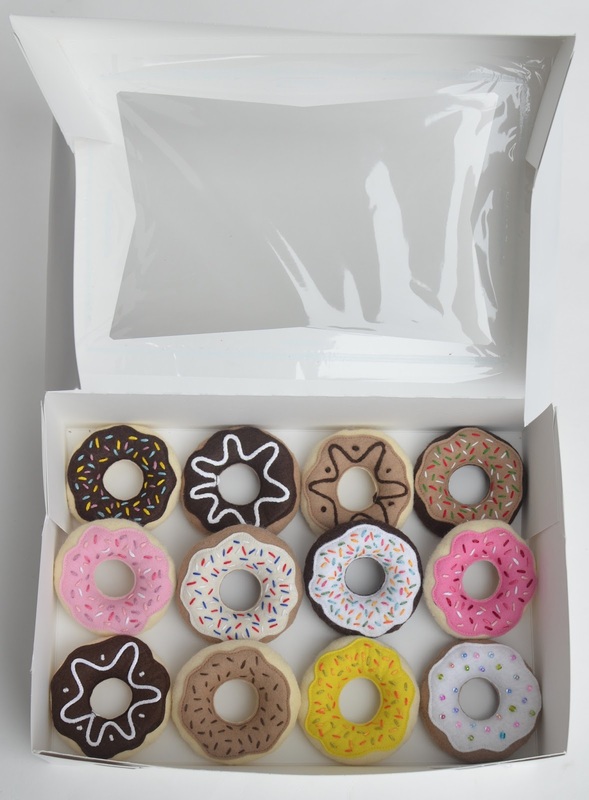 I love your doughnuts and went back and read the original doughnut post again. I am in the middle of making a batch of strawberry and chocolate doughnuts using the Skip To My Lou pattern you linked to. I think I should have made the middle hole smaller, as my doughnuts seem a little skinny. They're still adorable and I'm sure my girls will love playing with them. 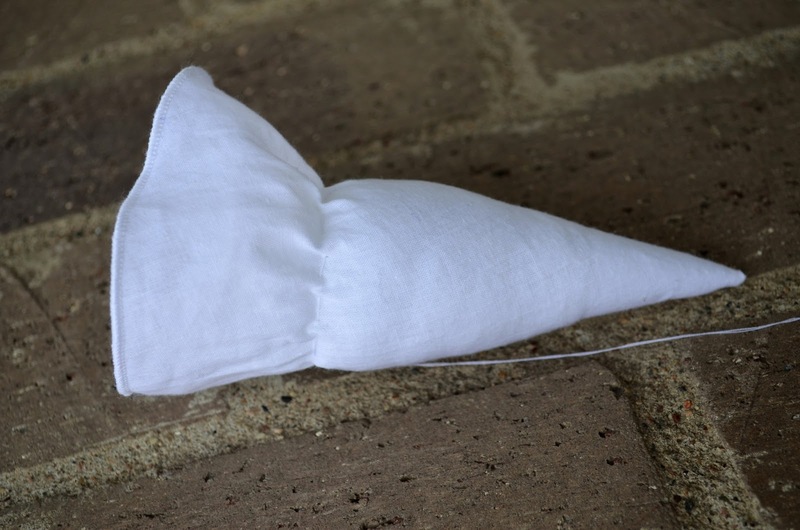 I am, once again, envious of your superior sewing skills. I found it hard to sew as neatly and as close to the edge as you do. 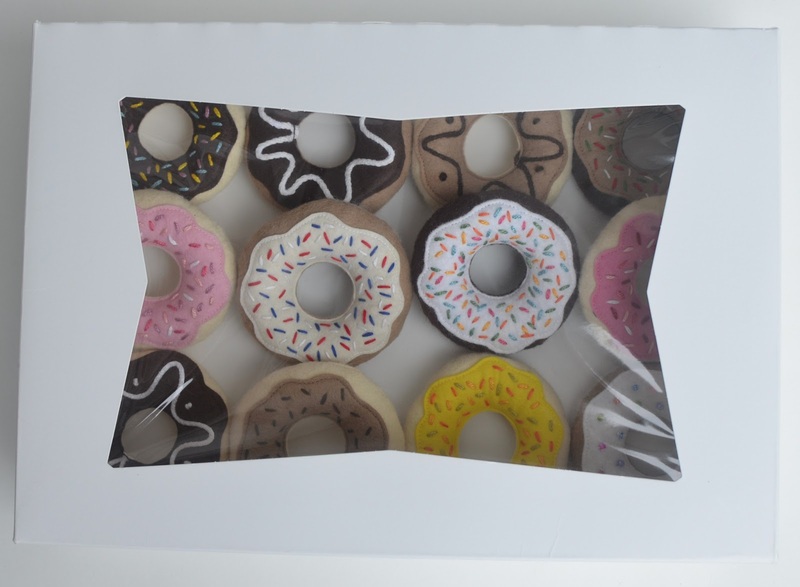 Katie M: I didn't use her pattern as is for these donuts. For that very first batch in 2009, I did and found that, like you did, they were a bit skinny and small. I adapted the pattern and yes, the holes of my donuts are a fair bit smaller and the the whole donut is a bit bigger. Nothing wrong with the skinny and small, but a plumper donut gives more room for frosting and embellishing. 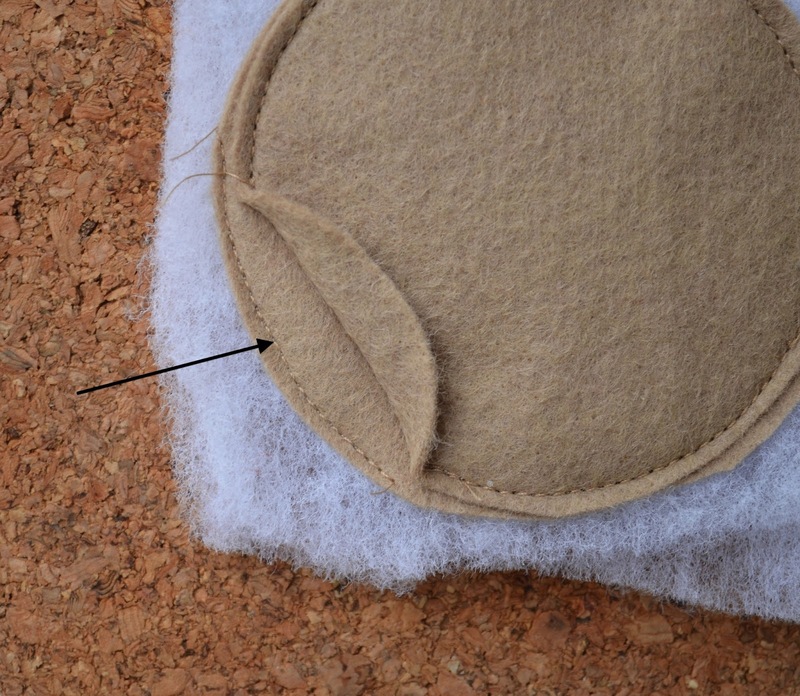 Also, to sew close to the edge, don't cut the middle hole out until the very last stage. 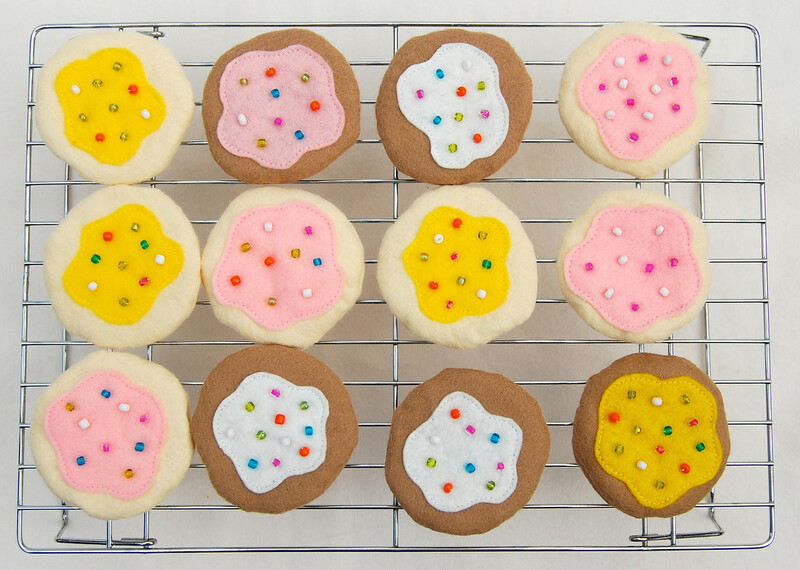 So cut the hole only in the FROSTING piece, then sew that onto the first circular dough piece which has no hole. Then sew that circular piece to the other circular piece (also no hole), RS together. 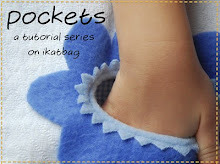 Turn RS out, then sew the hole in the middle. You should have just the hole in the frosting to sew around the edge of. NOW cut open the dough holes (2 layers). This is how to sew close to the edge so "everything lines up". You are completely brilliant LiEr. 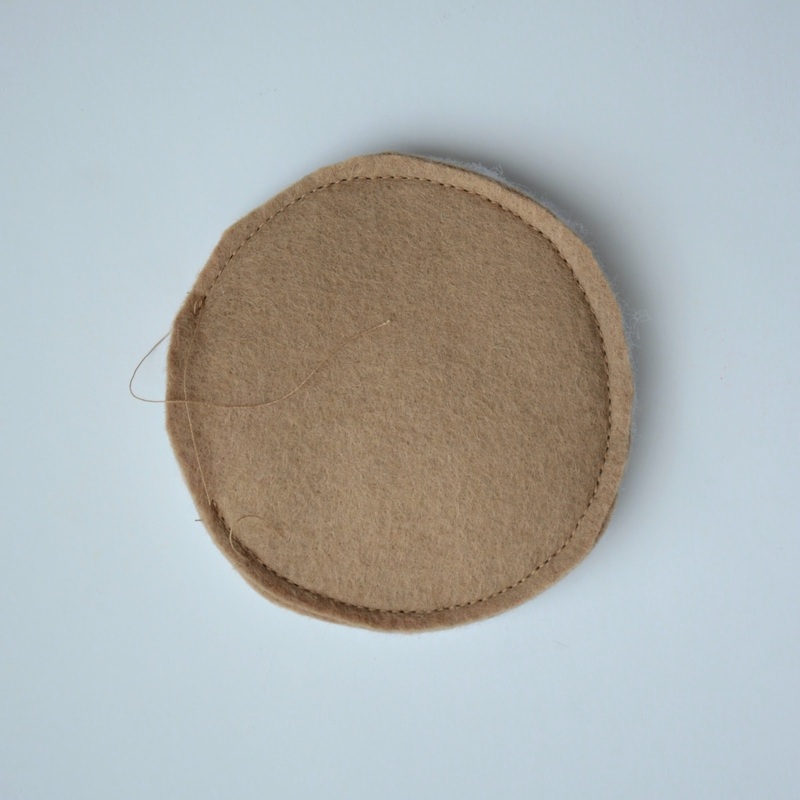 I was going to try sewing the circle without cutting any of the holes, but your suggestion is so much more sensible.